1. 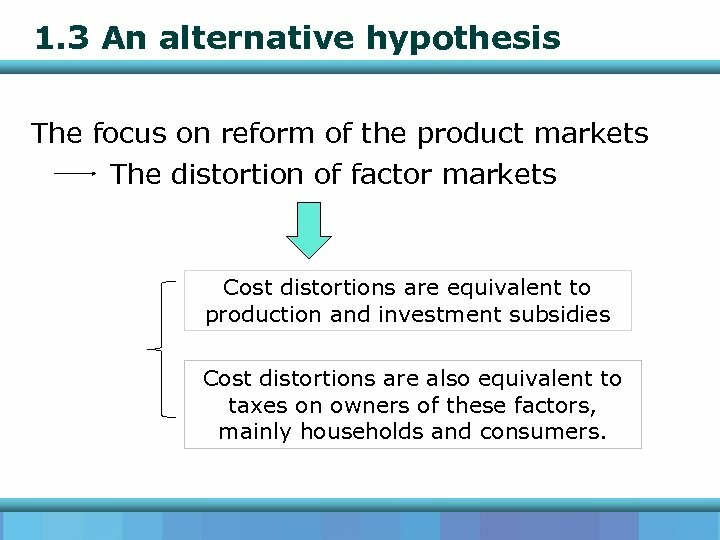 3 An alternative hypothesis The focus on reform of the product markets The distortion of factor markets Cost distortions are equivalent to production and investment subsidies Cost distortions are also equivalent to taxes on owners of these factors, mainly households and consumers. 4. 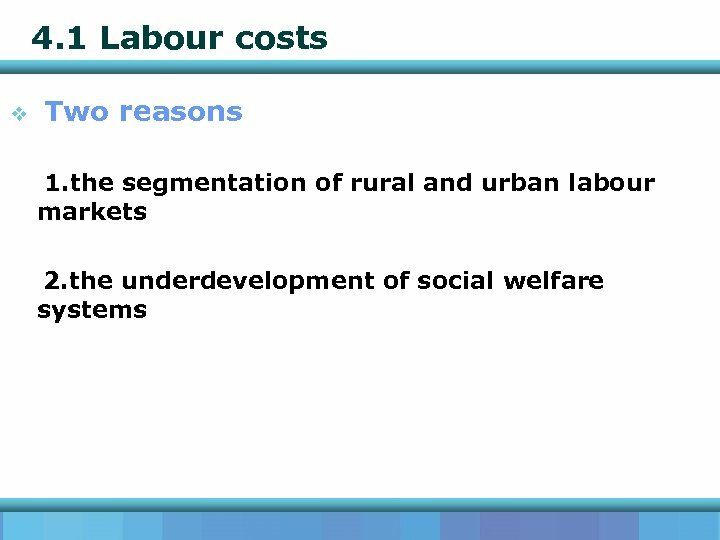 1 Labour costs The segmentation of labour markets 1. 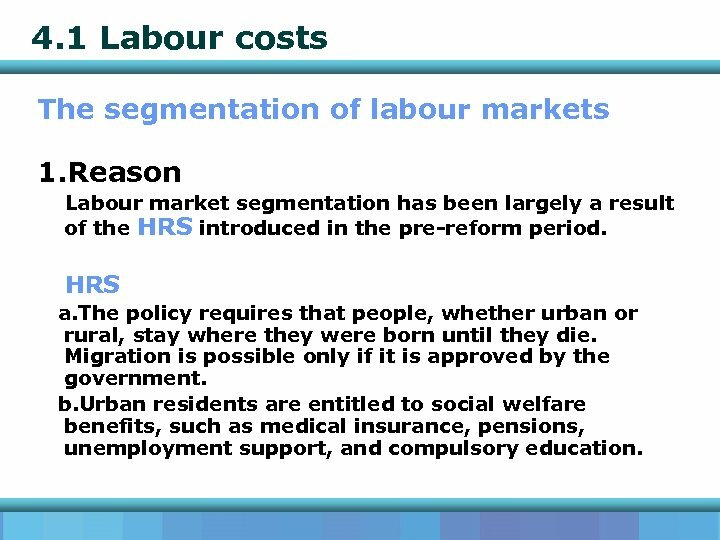 Reason Labour market segmentation has been largely a result of the HRS introduced in the pre-reform period. HRS a. The policy requires that people, whether urban or rural, stay where they were born until they die. Migration is possible only if it is approved by the government. b. 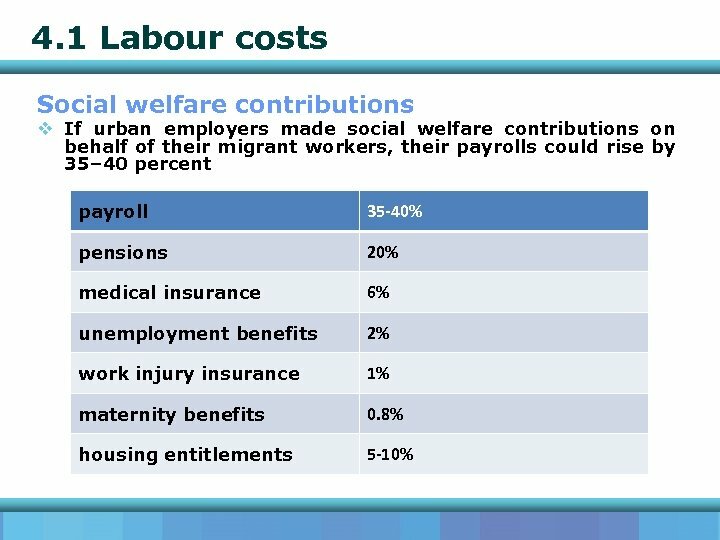 Urban residents are entitled to social welfare benefits, such as medical insurance, pensions, unemployment support, and compulsory education. 4. 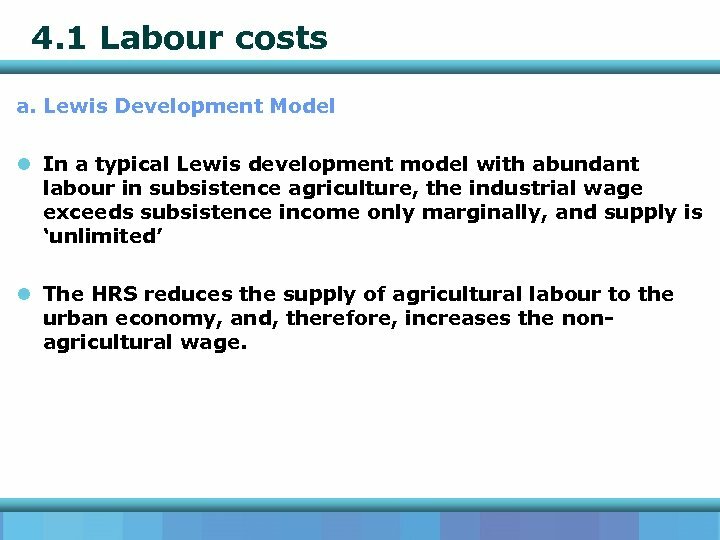 1 Labour costs a. Lewis Development Model l In a typical Lewis development model with abundant labour in subsistence agriculture, the industrial wage exceeds subsistence income only marginally, and supply is ‘unlimited’ l The HRS reduces the supply of agricultural labour to the urban economy, and, therefore, increases the nonagricultural wage. 4. 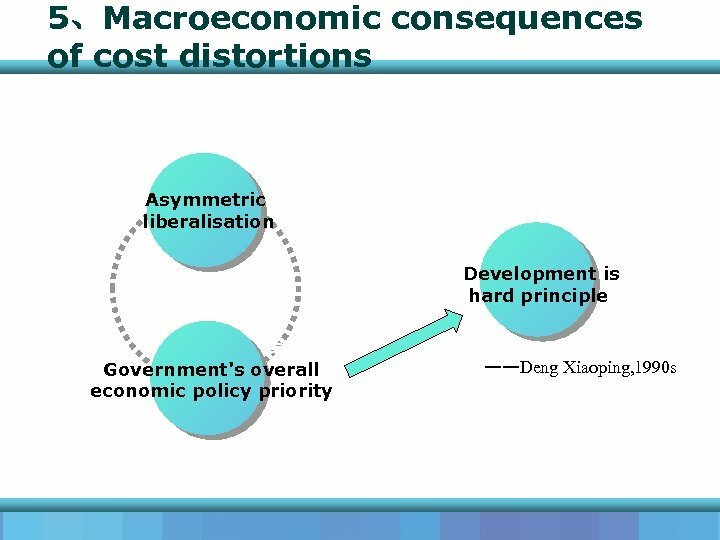 1 Labour costs b. the Lewisian Turning Point l Ryoshin Minami and Ma Xin demonstrated through empirical estimation that China still had a large surplus of labour in agriculture. 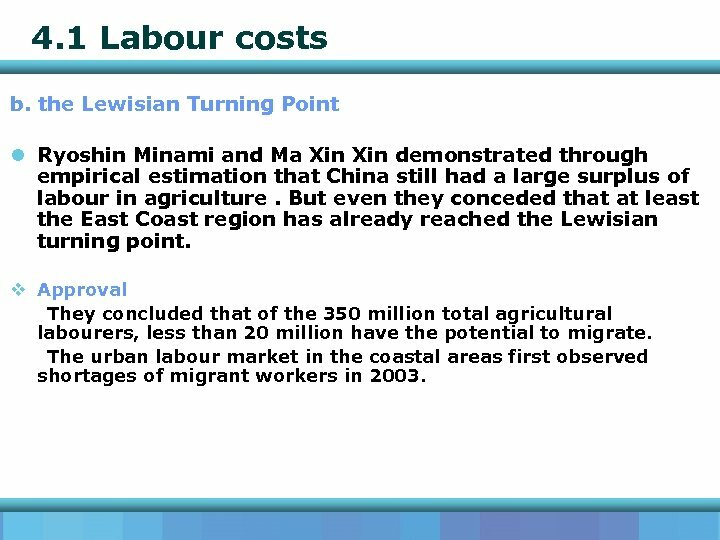 But even they conceded that at least the East Coast region has already reached the Lewisian turning point. v Approval They concluded that of the 350 million total agricultural labourers, less than 20 million have the potential to migrate. The urban labour market in the coastal areas first observed shortages of migrant workers in 2003. 4. 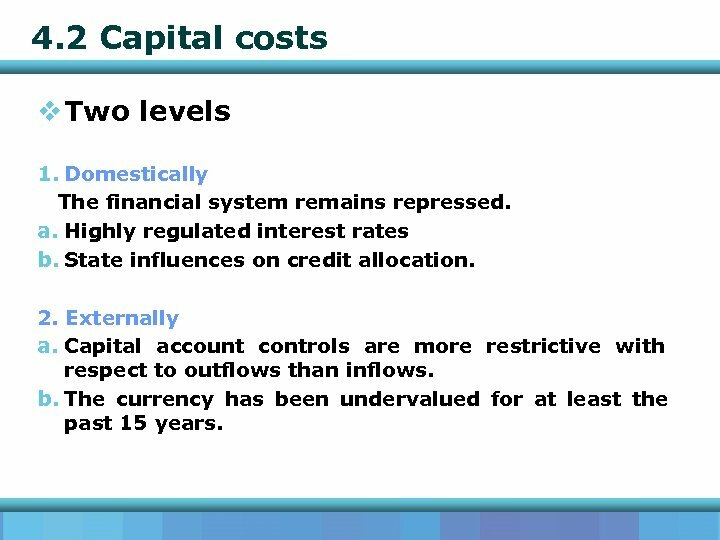 2 Capital costs v Two levels 1. Domestically The financial system remains repressed. a. 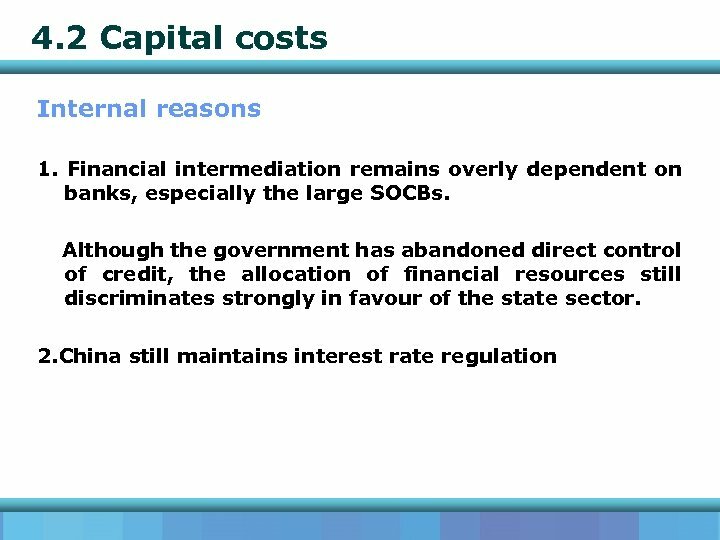 Highly regulated interest rates b. 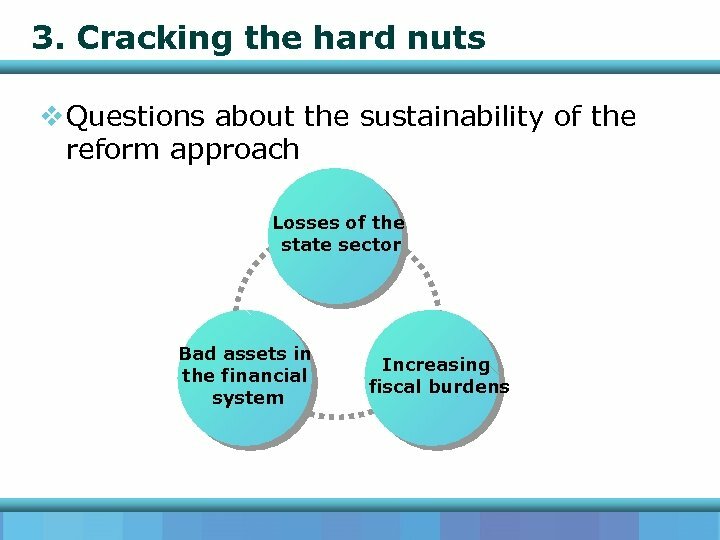 State influences on credit allocation. 2. Externally a. 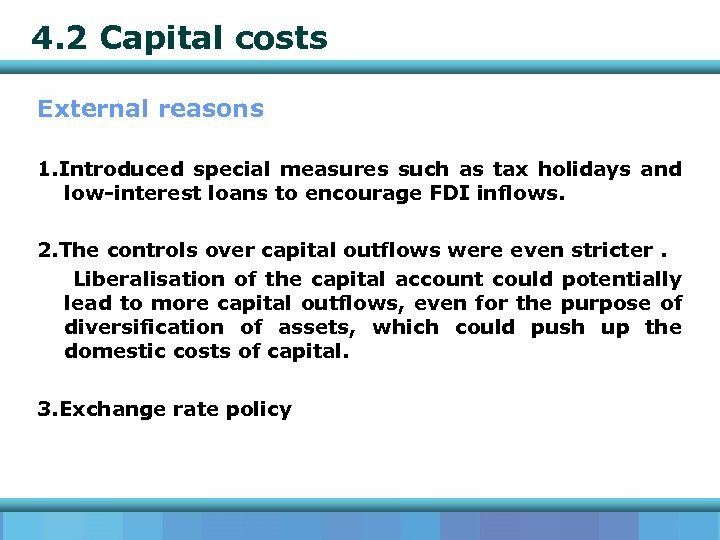 Capital account controls are more restrictive with respect to outflows than inflows. b. The currency has been undervalued for at least the past 15 years. 4. 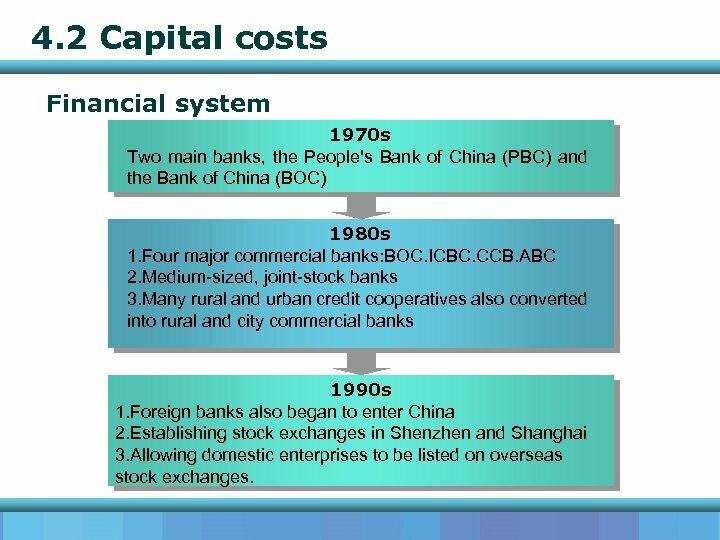 2 Capital costs Financial system 1970 s Two main banks, the People's Bank of China (PBC) and the Bank of China (BOC) 1980 s 1. Four major commercial banks: BOC. ICBC. CCB. 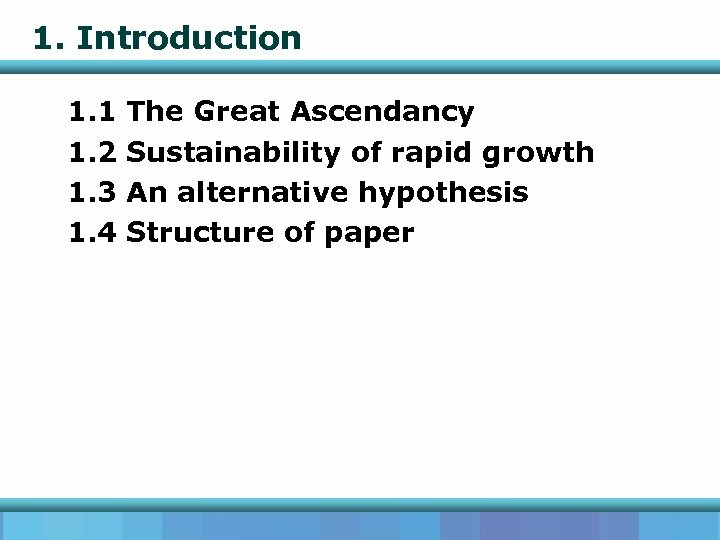 ABC 2. 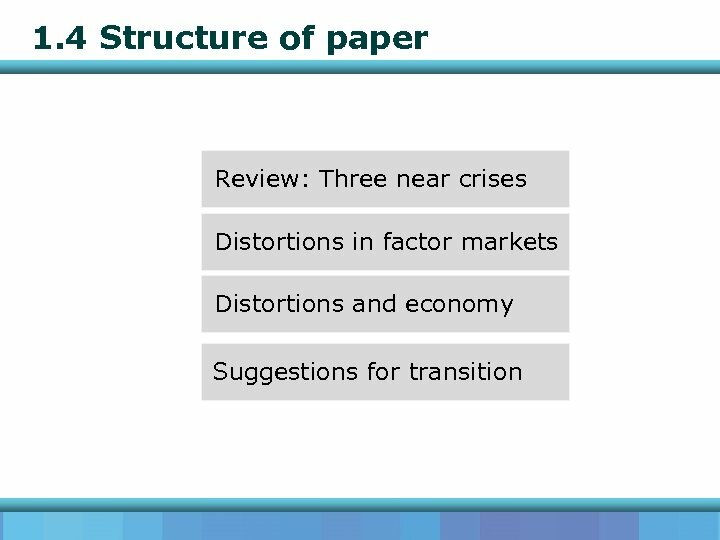 Medium-sized, joint-stock banks 3. 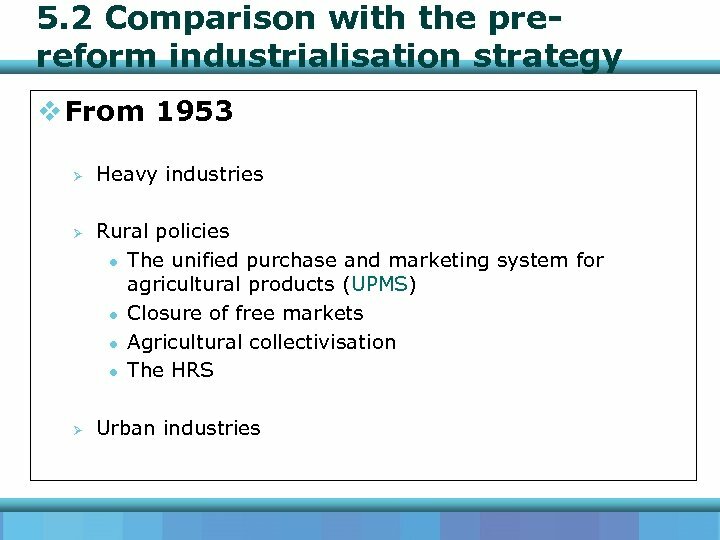 Many rural and urban credit cooperatives also converted into rural and city commercial banks 1990 s 1. 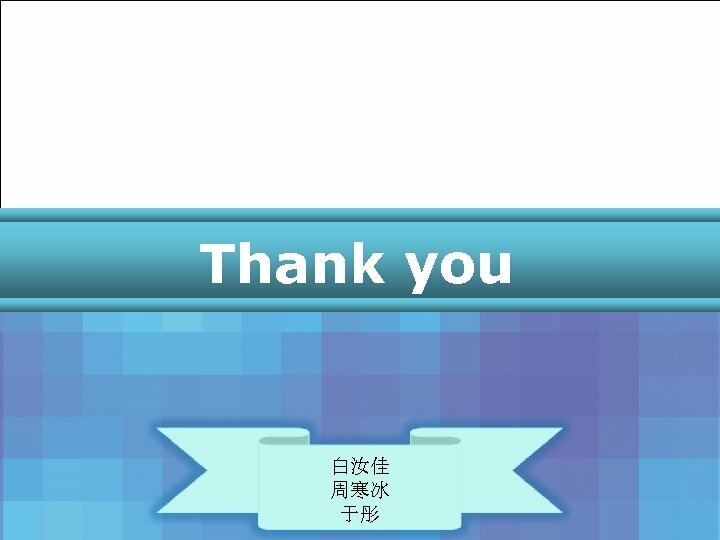 Foreign banks also began to enter China 2. Establishing stock exchanges in Shenzhen and Shanghai 3. Allowing domestic enterprises to be listed on overseas stock exchanges. 4. 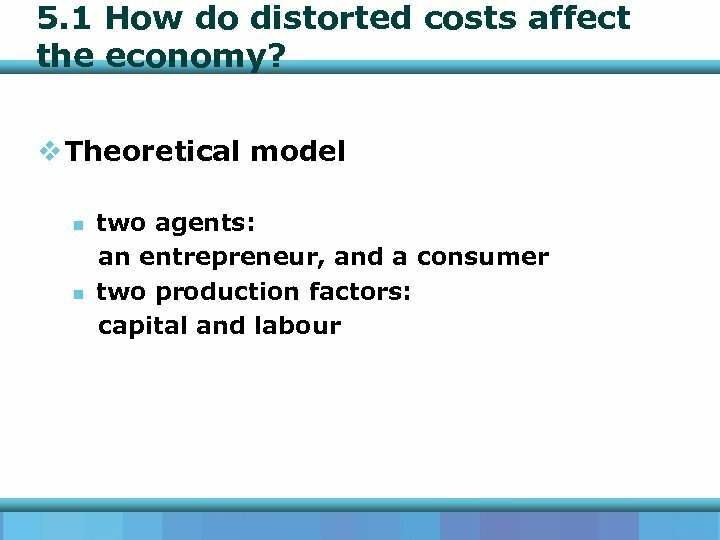 2 Capital costs Internal reasons 3. 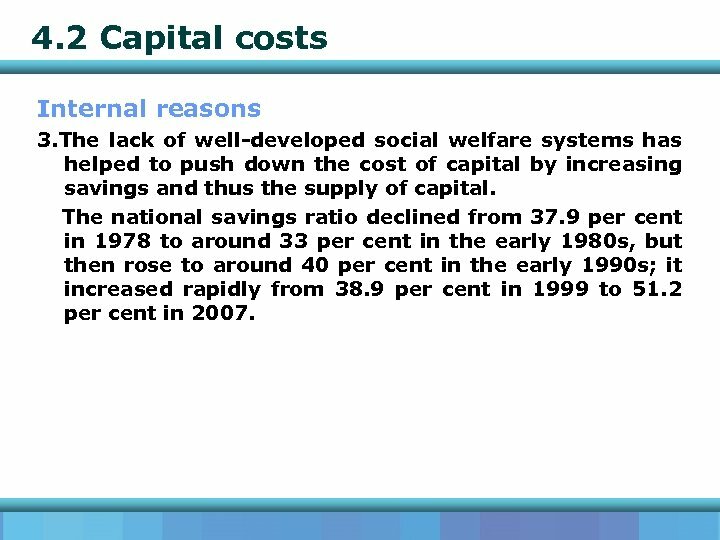 The lack of well-developed social welfare systems has helped to push down the cost of capital by increasing savings and thus the supply of capital. The national savings ratio declined from 37. 9 per cent in 1978 to around 33 per cent in the early 1980 s, but then rose to around 40 per cent in the early 1990 s; it increased rapidly from 38. 9 per cent in 1999 to 51. 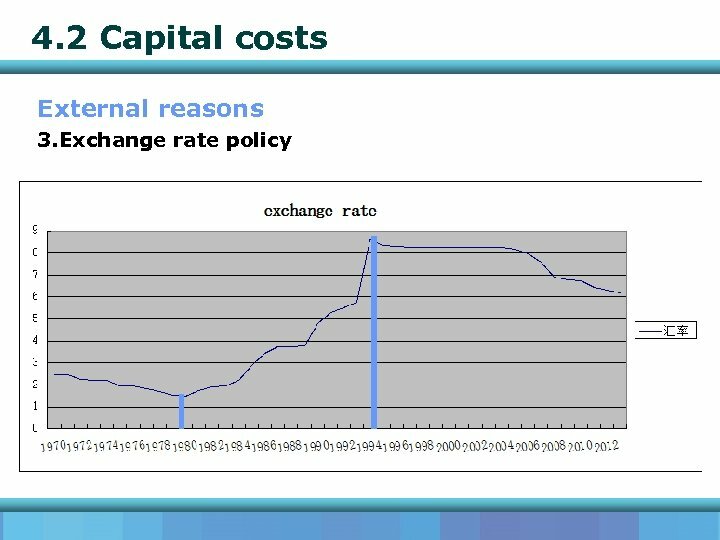 2 per cent in 2007. 4. 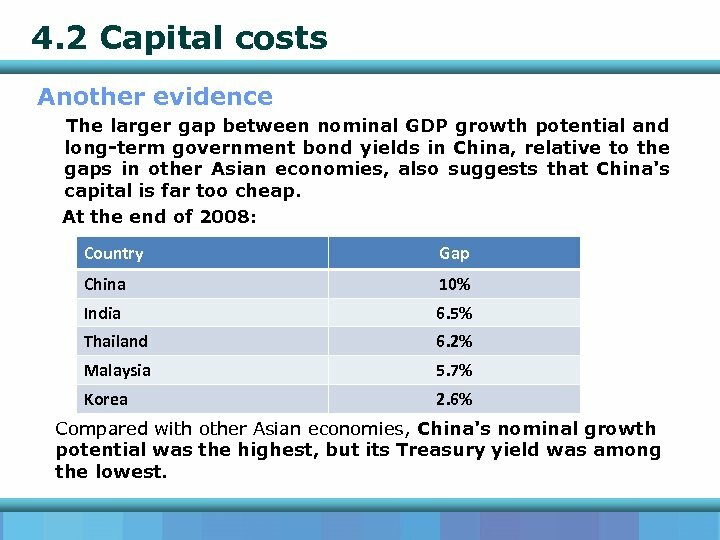 2 Capital costs Another evidence The larger gap between nominal GDP growth potential and long-term government bond yields in China, relative to the gaps in other Asian economies, also suggests that China's capital is far too cheap. 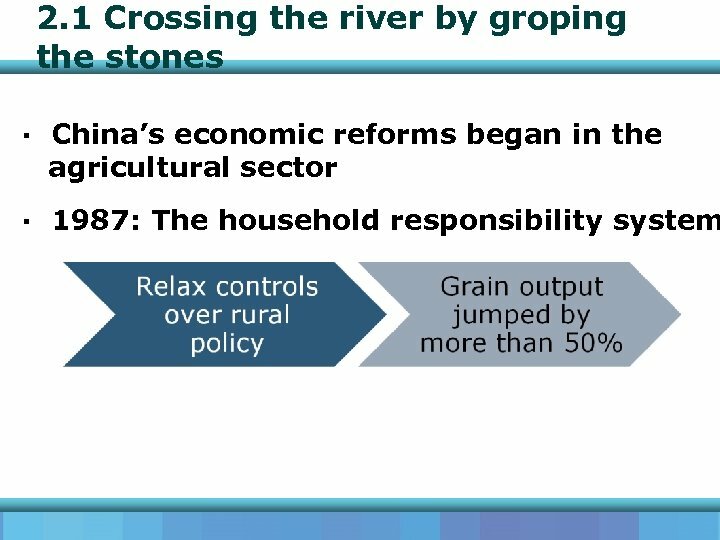 At the end of 2008: Country Gap China 10% India 6. 5% Thailand 6. 2% Malaysia 5. 7% Korea 2. 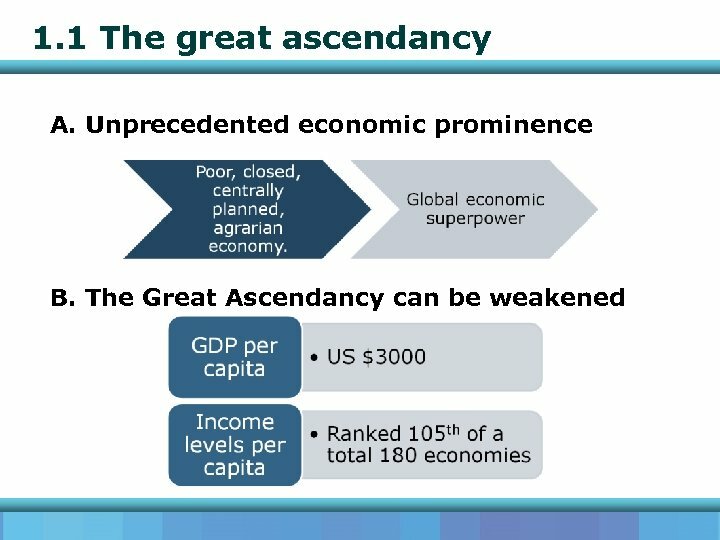 6% Compared with other Asian economies, China's nominal growth potential was the highest, but its Treasury yield was among the lowest. 4. 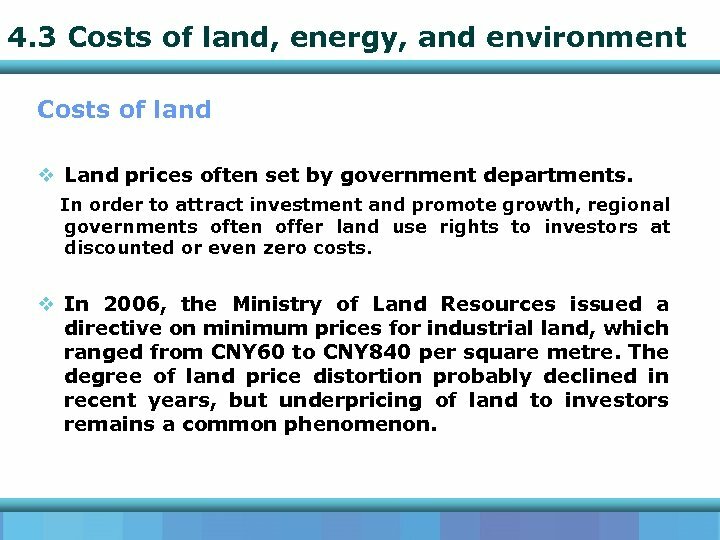 3 Costs of land, energy, and environment Costs of land v Land prices often set by government departments. In order to attract investment and promote growth, regional governments often offer land use rights to investors at discounted or even zero costs. 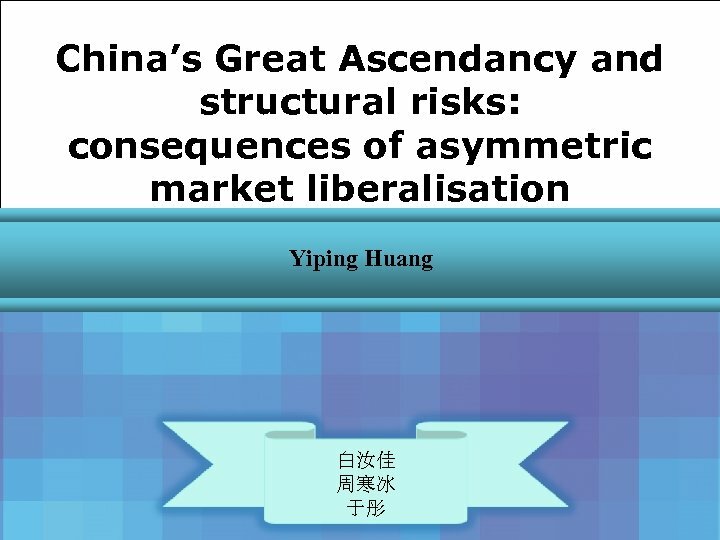 v In 2006, the Ministry of Land Resources issued a directive on minimum prices for industrial land, which ranged from CNY 60 to CNY 840 per square metre. The degree of land price distortion probably declined in recent years, but underpricing of land to investors remains a common phenomenon. 4. 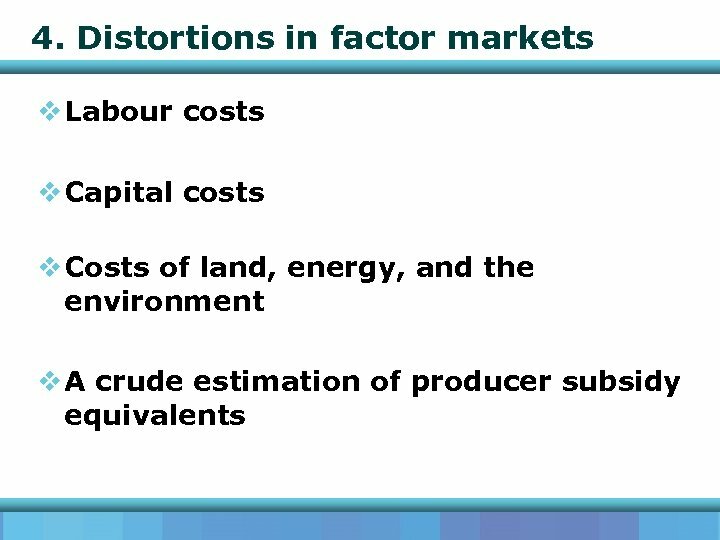 3 Costs of land, energy, and environment Costs of energy 1. 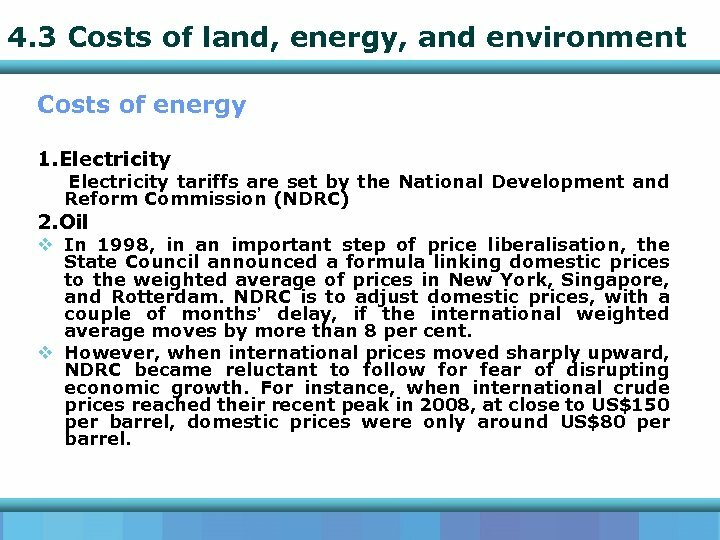 Electricity tariffs are set by the National Development and Reform Commission (NDRC) 2. 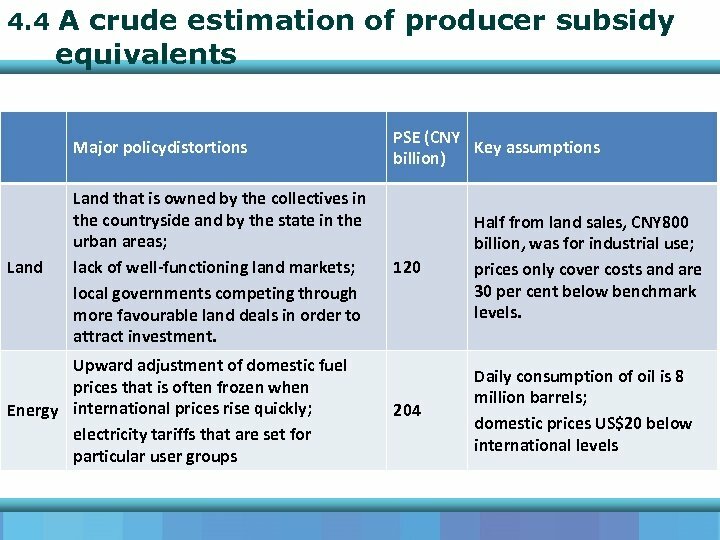 Oil v In 1998, in an important step of price liberalisation, the State Council announced a formula linking domestic prices to the weighted average of prices in New York, Singapore, and Rotterdam. NDRC is to adjust domestic prices, with a couple of months’ delay, if the international weighted average moves by more than 8 per cent. 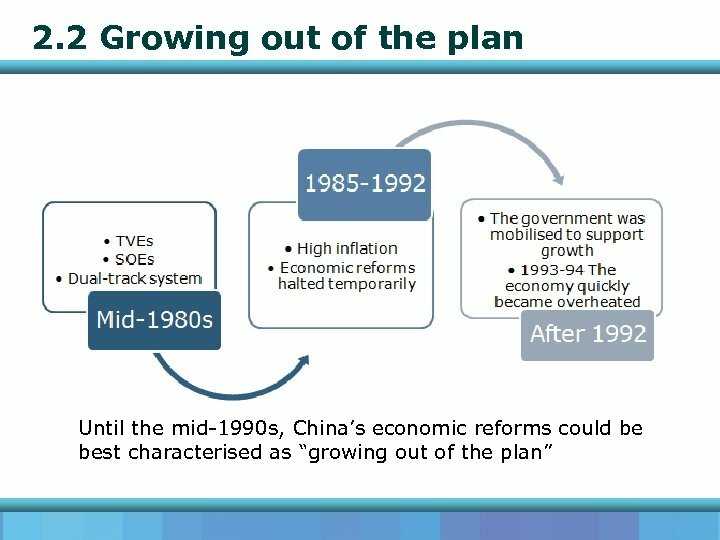 v However, when international prices moved sharply upward, NDRC became reluctant to follow for fear of disrupting economic growth. 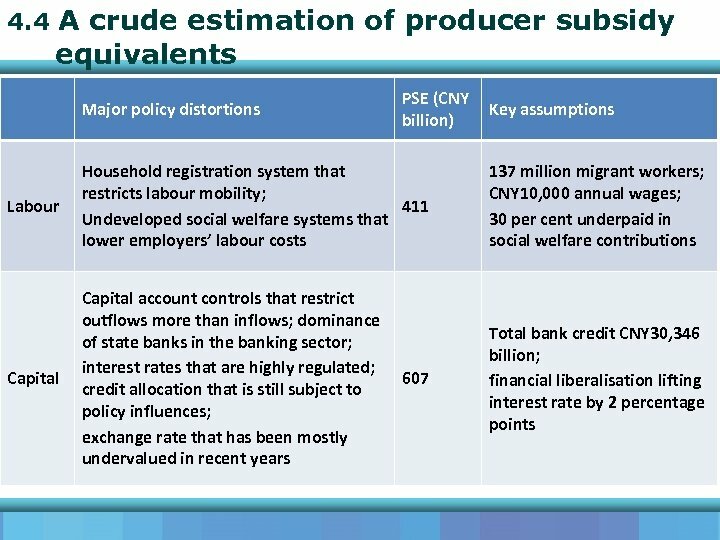 For instance, when international crude prices reached their recent peak in 2008, at close to US$150 per barrel, domestic prices were only around US$80 per barrel. 4. 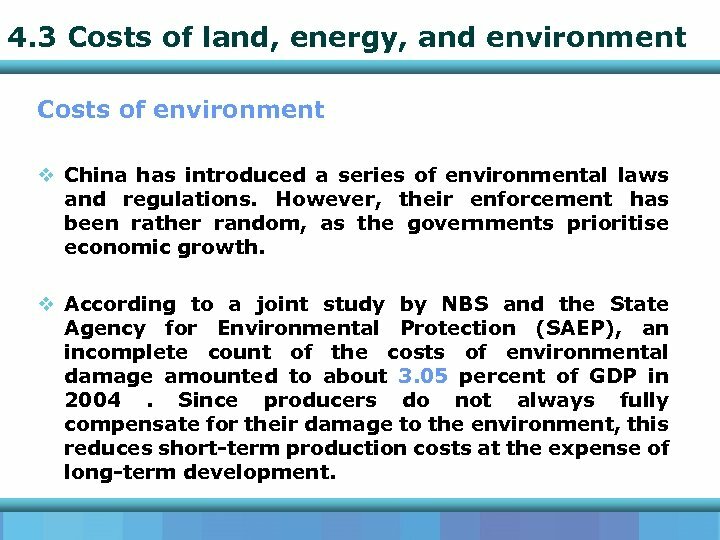 3 Costs of land, energy, and environment Costs of environment v China has introduced a series of environmental laws and regulations. 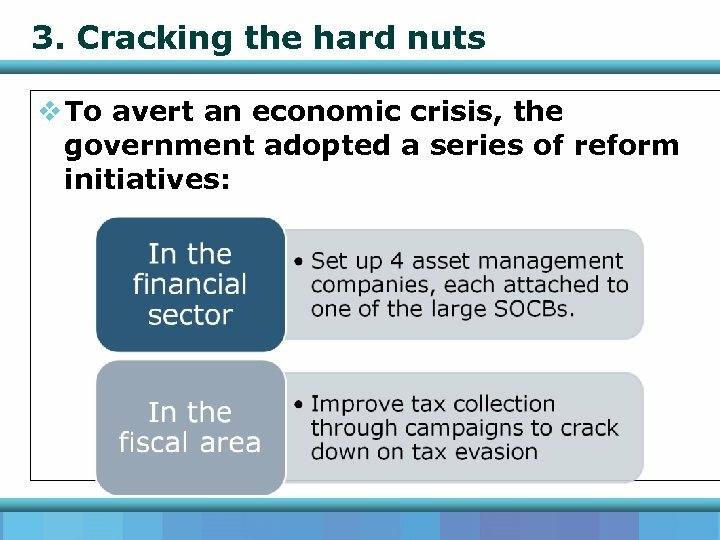 However, their enforcement has been rather random, as the governments prioritise economic growth. v According to a joint study by NBS and the State Agency for Environmental Protection (SAEP), an incomplete count of the costs of environmental damage amounted to about 3. 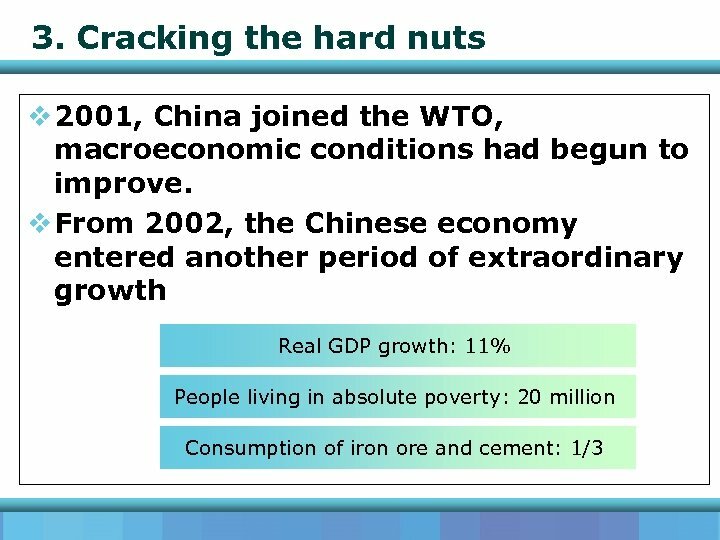 05 percent of GDP in 2004. Since producers do not always fully compensate for their damage to the environment, this reduces short-term production costs at the expense of long-term development. 4. 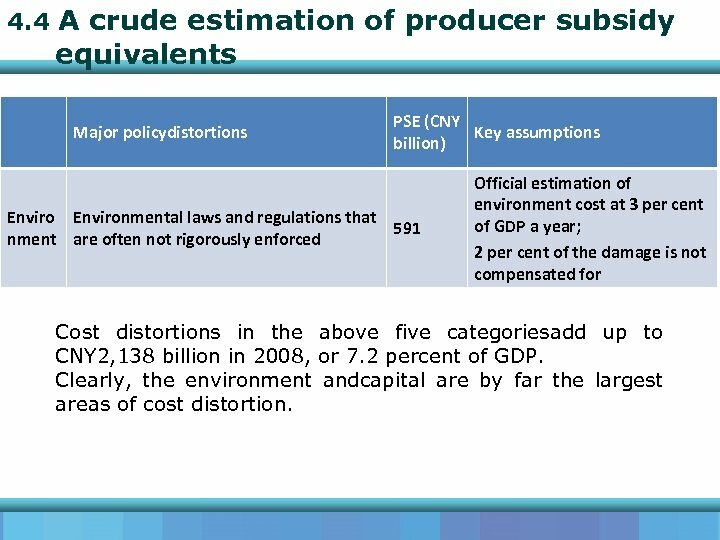 4 A crude estimation of producer subsidy equivalents Major policydistortions PSE (CNY Key assumptions billion) Environmental laws and regulations that 591 nment are often not rigorously enforced Official estimation of environment cost at 3 per cent of GDP a year; 2 per cent of the damage is not compensated for Cost distortions in the above five categoriesadd up to CNY 2, 138 billion in 2008, or 7. 2 percent of GDP. 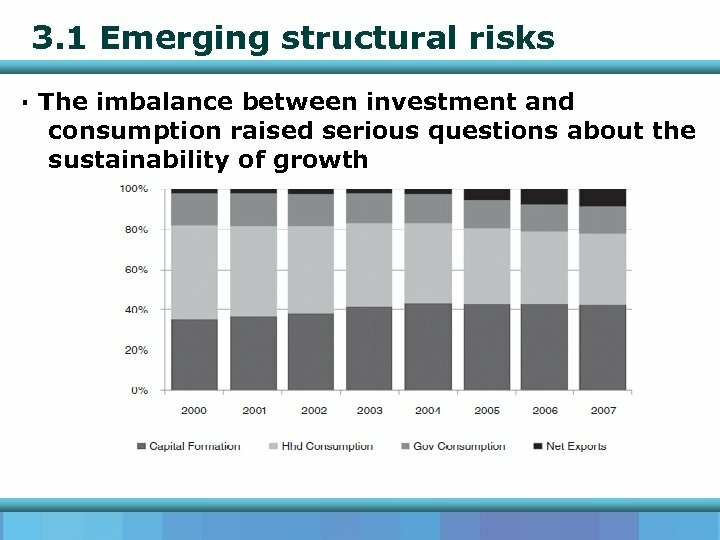 Clearly, the environment andcapital are by far the largest areas of cost distortion. 5. 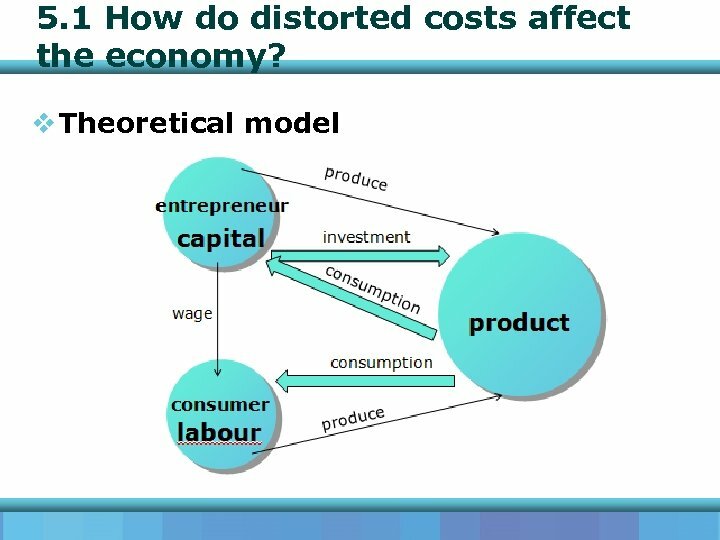 1 How do distorted costs affect the economy? 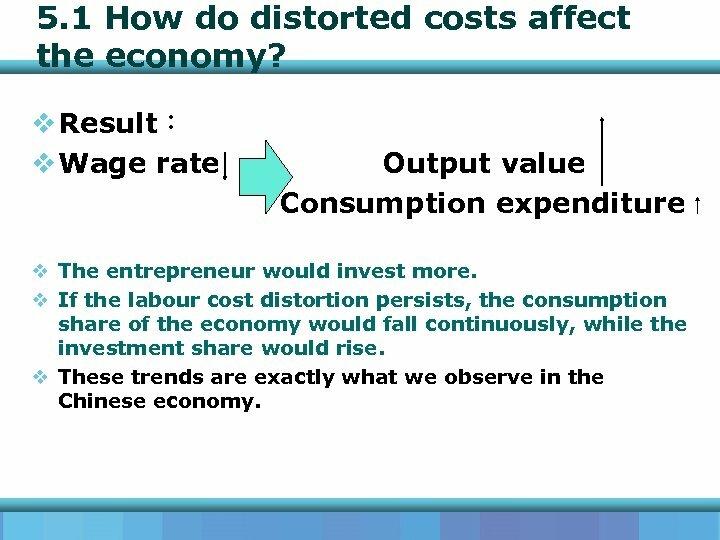 v Result： v Wage rate Output value Consumption expenditure v The entrepreneur would invest more. 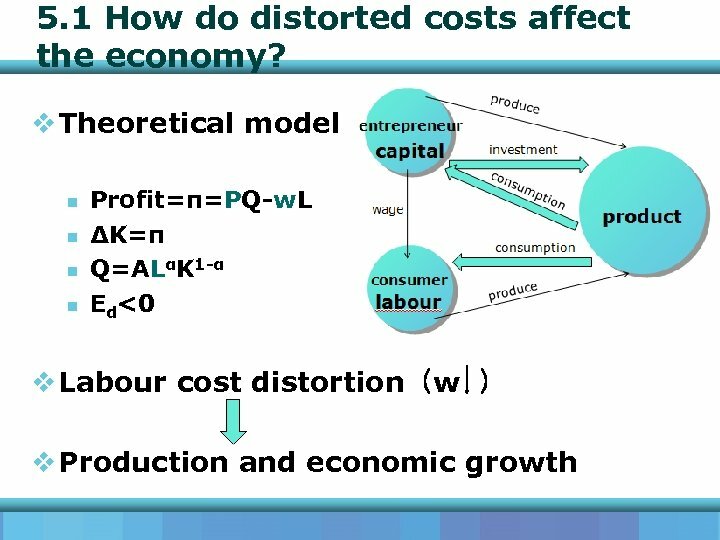 v If the labour cost distortion persists, the consumption share of the economy would fall continuously, while the investment share would rise. 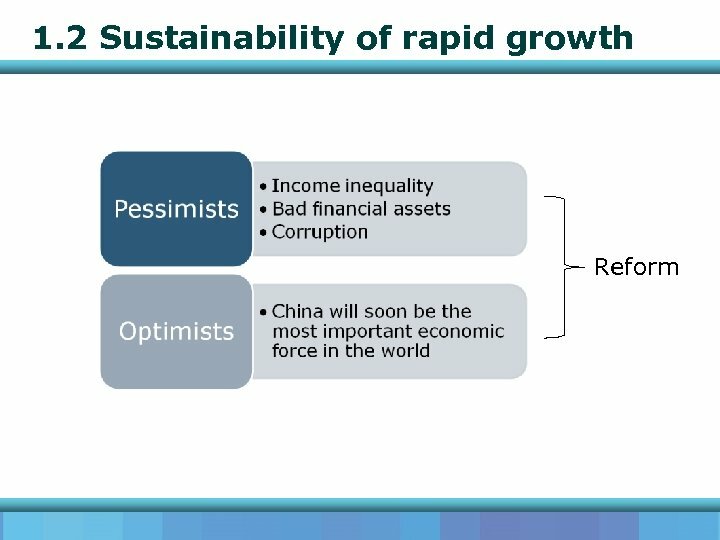 v These trends are exactly what we observe in the Chinese economy. 5. 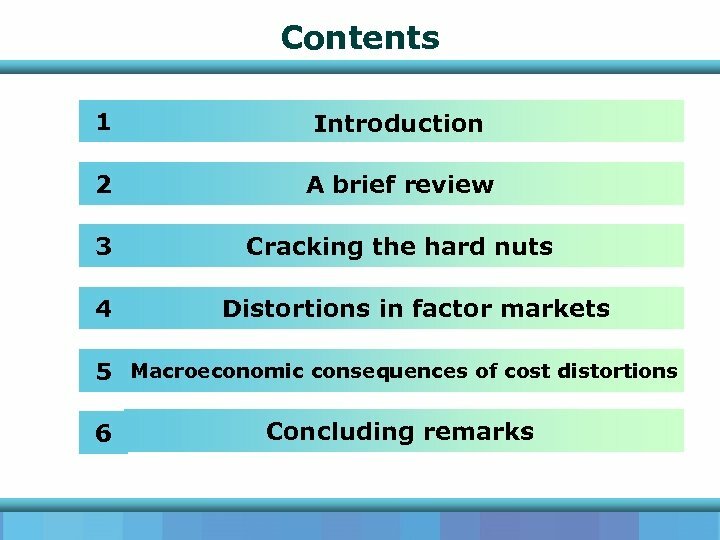 1 How do distorted costs affect the economy? 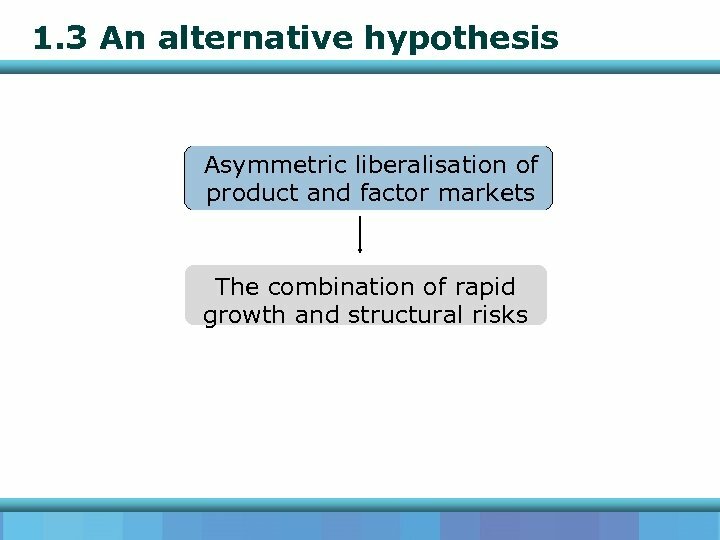 v Restrictive assumptions： An open economy Ø Ø Ø Only one factor ？？？ The consumer does not save There are no exports and imports v However, relaxation of these restrictions would be unlikely to change the conclusions. 5. 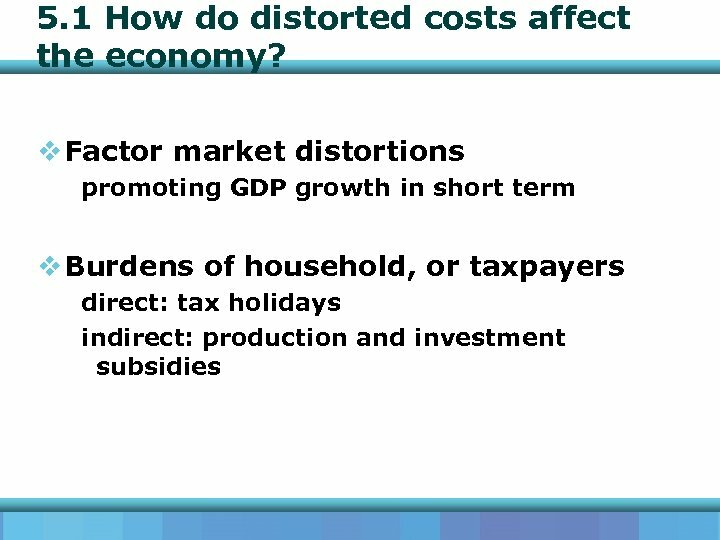 1 How do distorted costs affect the economy? 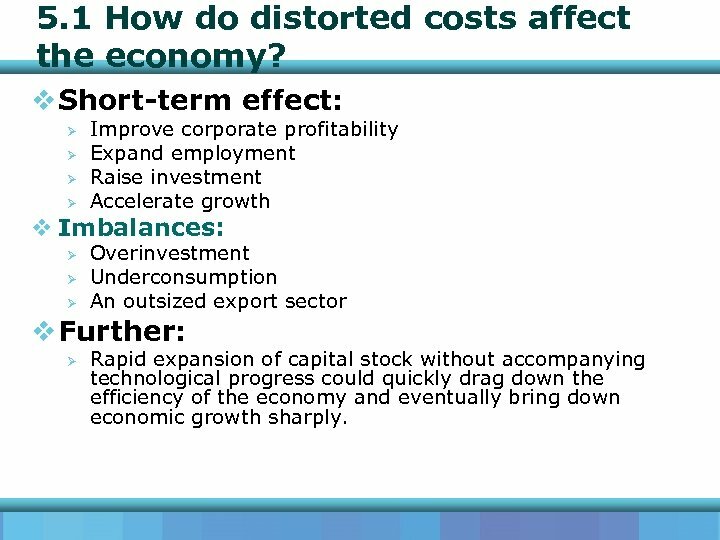 v Short-term effect: Ø Ø Improve corporate profitability Expand employment Raise investment Accelerate growth v Imbalances: Ø Ø Ø Overinvestment Underconsumption An outsized export sector v Further: Ø Rapid expansion of capital stock without accompanying technological progress could quickly drag down the efficiency of the economy and eventually bring down economic growth sharply. 5. 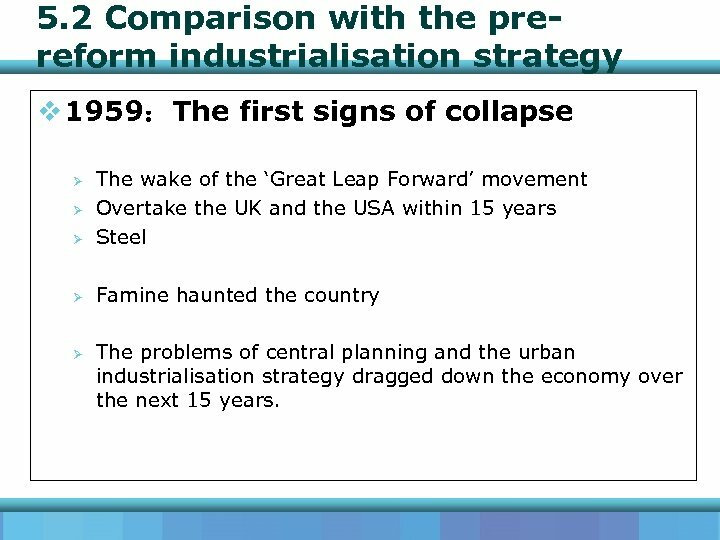 2 Comparison with the prereform industrialisation strategy v 1959：The first signs of collapse Ø The wake of the ‘Great Leap Forward’ movement Overtake the UK and the USA within 15 years Steel Ø Famine haunted the country Ø Ø Ø The problems of central planning and the urban industrialisation strategy dragged down the economy over the next 15 years. 5. 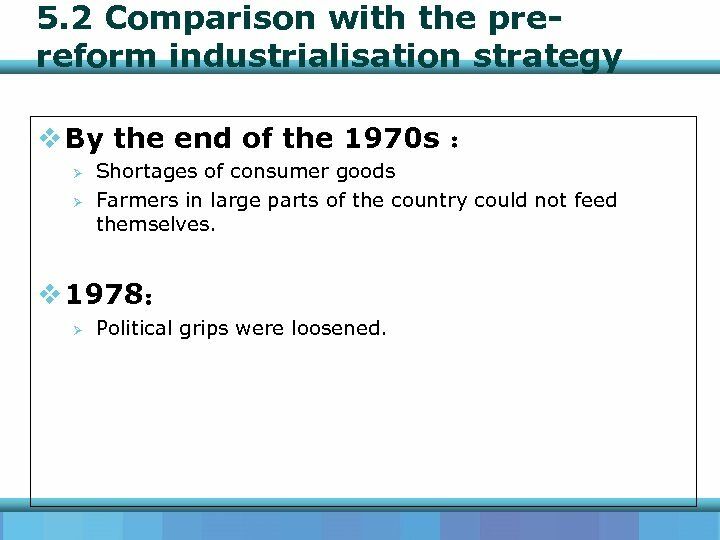 2 Comparison with the prereform industrialisation strategy v By the end of the 1970 s ： Ø Ø Shortages of consumer goods Farmers in large parts of the country could not feed themselves. v 1978： Ø Political grips were loosened. 5. 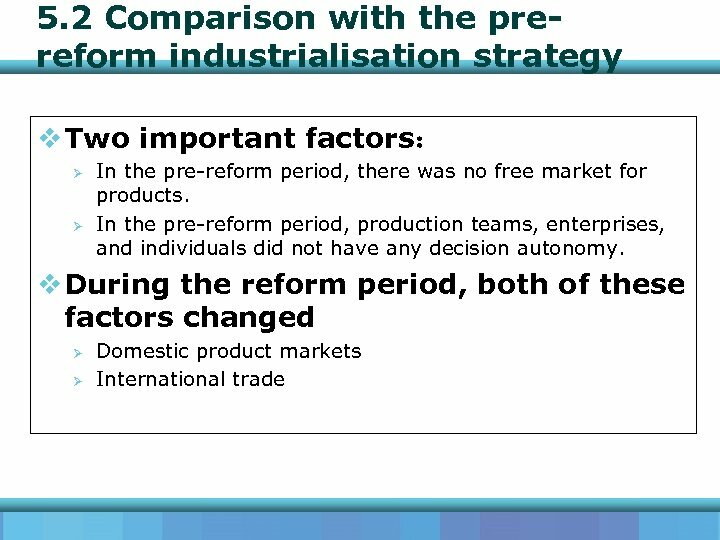 2 Comparison with the prereform industrialisation strategy v Pre-reform industrialisation strategy parallel v The post-reform growth model： Ø Ø Why does the current regime appear to work much better? 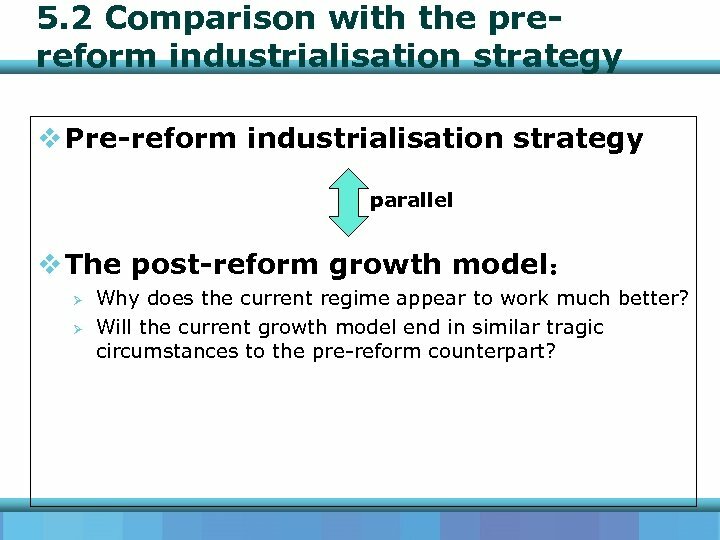 Will the current growth model end in similar tragic circumstances to the pre-reform counterpart? 5. 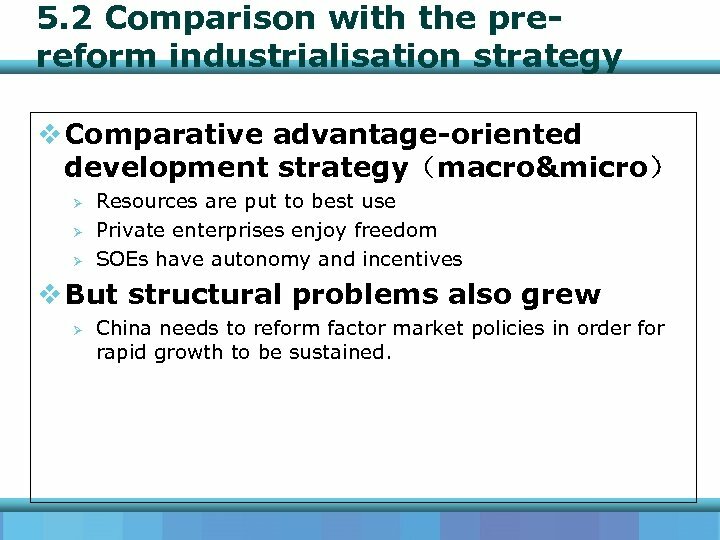 2 Comparison with the prereform industrialisation strategy v Comparative advantage-oriented development strategy（macroµ） Ø Ø Ø Resources are put to best use Private enterprises enjoy freedom SOEs have autonomy and incentives v But structural problems also grew Ø China needs to reform factor market policies in order for rapid growth to be sustained. 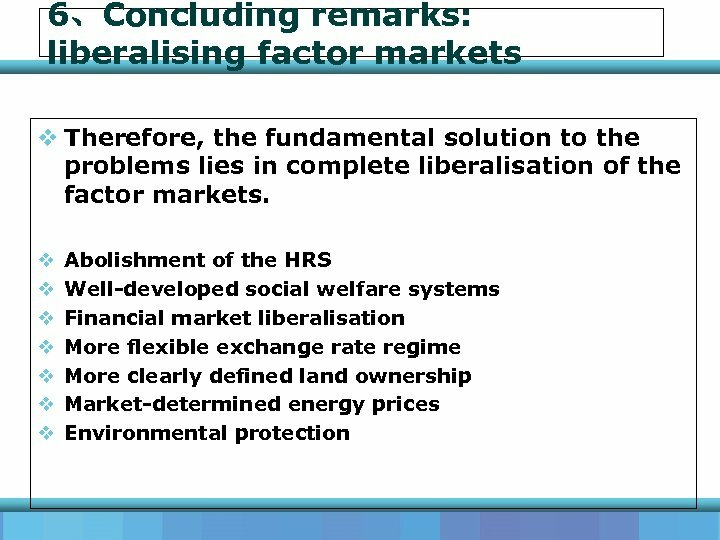 6、Concluding remarks: liberalising factor markets v The root cause of the imbalances and inefficiency problems is factor market distortions. 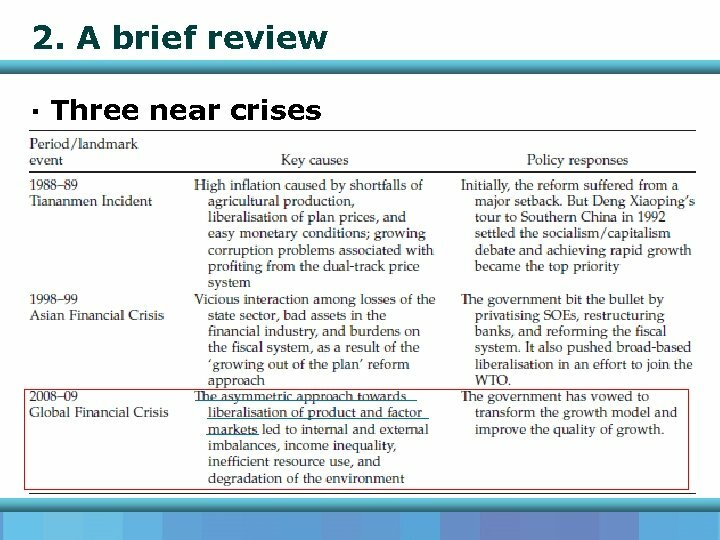 v History has shown that Chinese policy makers can act decisively when they face crises. 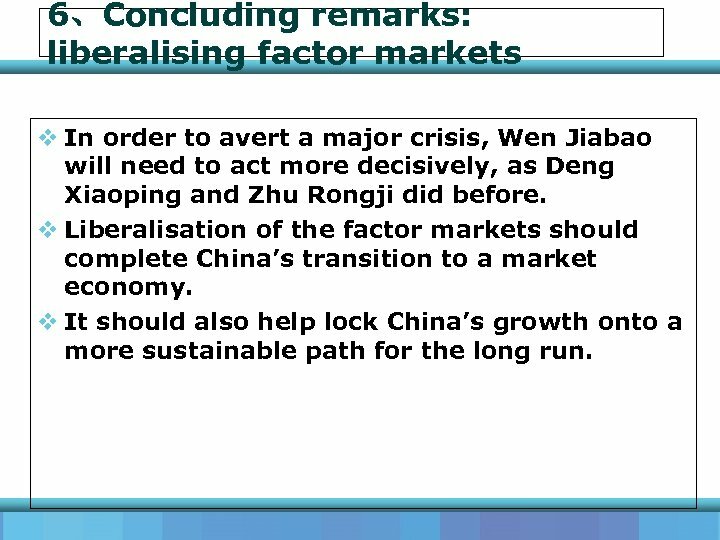 6、Concluding remarks: liberalising factor markets v In order to avert a major crisis, Wen Jiabao will need to act more decisively, as Deng Xiaoping and Zhu Rongji did before. 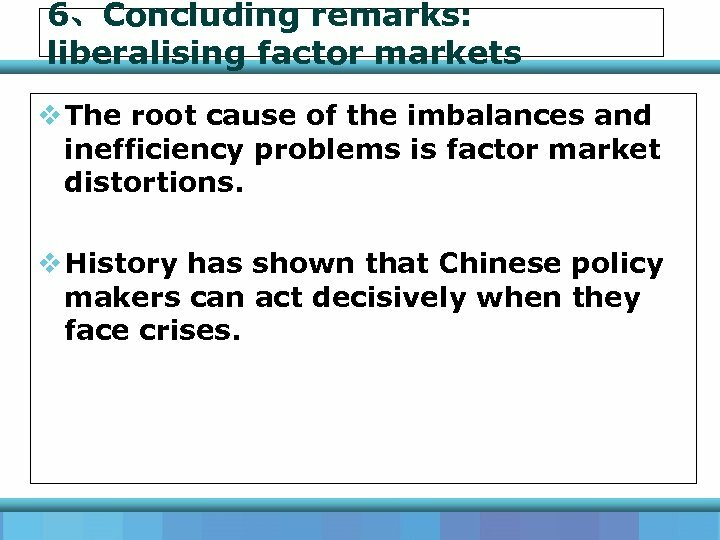 v Liberalisation of the factor markets should complete China’s transition to a market economy. 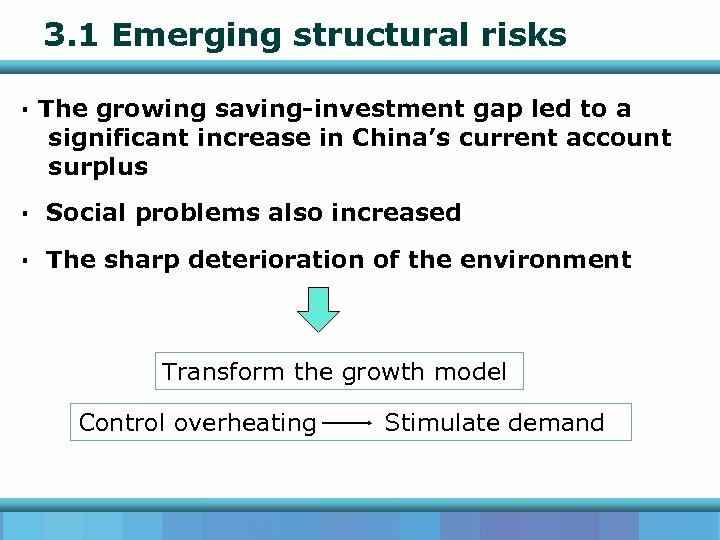 v It should also help lock China’s growth onto a more sustainable path for the long run.